Russian manufactured YotaPhone 2 was announced first in the Mobile World Congress 2014 which took place at Barcelona. Since then there has been no bruit heard about the Phone which claimed to bring e-ink screen. Finally, news is circulating that the device is finally heading towards release. YotaPhone posted on Twitter that the phone is rolling out by the end of this year. 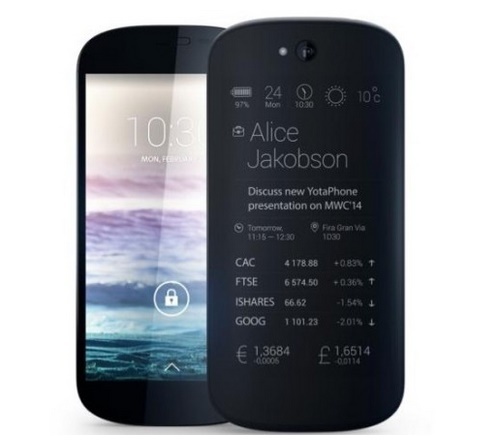 YotaPhone is holding an event at London on December 3 and this is the right event to launch the YotaPhone. Over this entire year we got nothing to hear about any update except the one that YotaPhone store is going to set up in Canada. YotaPhone stores are there in many parts of Russia, Europr, Middle East and also in India and Malayasia. The device is a pebble shaped phone with a sleek design, and a full-touch secondary e-ink 960×540 screen on the back. The most promising feature is the e-ink screen. The main advantage of the screen is high visibility and low battery consumption. But there is one con of this type of screen. The low refresh rate of e-ink screen refrains from displaying smooth animations. Other benefits include displaying notifications, stock data, fitness data, and social updates. Specifications are also revamped. Till now, there has been no update on price or the locations where the devices will initially launch. We will update as soon as we get to know.